All over the country, people are posting pictures of their new family pets using #ClearTheShelters on social media. Hannah the pit bull left a Maryland shelter Saturday with her new family and a pink tutu, becoming one of thousands of animals adopted during the Clear the Shelters drive. The tutu came courtesy of a volunteer at the Humane Society of Calvert County in Sunderland, Maryland, who wanted to dress up the happy pup. The family – Amanda Krutilla, her 20-month-old son, Jax and her fiancé, Jason Bowles – was united with the dog thanks to the nationwide adoption push. Hannah is Krutilla's second pit bull. "They're just the biggest babies," said Krutilla, of California, Maryland. "Her tutu defines her." Nearly 20,000 animals were adopted as part of the nationwide adoption drive sponsored by 11 NBC owned television stations, the New England regional news network necn, and 17 Telemundo owned stations. More than 400 shelters participated, many offering the animals at a reduced price. 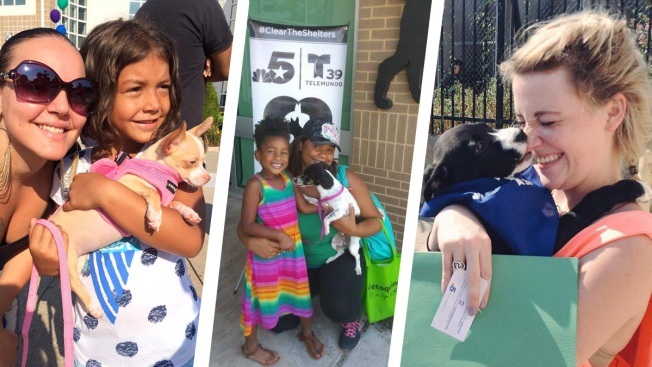 By the end of the day, 20 shelters reported that they had “cleared” all adoptable animals during the event, which was also sponsored by Overstock.com. “I am so proud that all of our stations came together with hundreds of animal shelters across the country, with the help of the ASPCA and our friends at Overstock.com, to find thousands of animals in need of their forever homes. We are all so grateful to everyone who opened their homes to these deserving pets on this national day of action,” Valari Staab, president of the NBCUniversal Owned Television Stations division of NBCUniversal, said in a statement. The day had just begun Saturday when a 2-month-old kitten named June was headed out the door of the Patricia H. Ladew Foundation, a cat sanctuary in Oyster Bay, New York. Kristen Pytell had seen June on Monday with her children, 11-year-old old Harry, Oliver, 9, and Lila, 7, and they knew she would be their first cat. “My kids and I fell in love with her,” said Pytell, and so they arrived first thing to bring her home. At the Salem New Hampshire Animal Rescue League, a pit bull named Baby – a 3-year-old surrendered a few weeks ago – was the first headed out the door this morning. "We are really excited that the first adoption of the day on this great Clear the Shelters initiative was a pit bull," said the shelter’s spokesman, B.J. Bettencourt. "Pit bulls can be a challenge to adopt, so we are thrilled that Baby found a home this morning." His new owner, Charlie Foote, a retired firefighter turned dog trainer, was not initially heading for the Salem Animal Rescue League. He happened to drive by, stop and spot Baby, who will have a new name by tonight, he said. "I instantly saw him and said, 'I want that dog,'" he said. Foote, of Derry, New Hampshire, has four other dogs at home and four children ages 6 to 12. Baby is already fitting in well, if still a little shy, he said Saturday afternoon. "They have a bad reputation, a bad name," he said. “I have a house full of little kids and these dogs are phenomenal." Lines quickly formed outside such places as the New Hampshire SPCA in Stratham, New Hampshire, Miami-Dade Florida Animal Services and Prince George’s Animal Services Facility in Upper Marlboro, Maryland. Red carpets were laid out so the new owners could be photographed with their furry friends. The Farago family – Laura, Andrew and 7 1/2-year-old Aaron – left the New Hampshire SPCA with a new puppy, a black lab mix that does not yet have a new name. They had to put their older dog down in the spring. The three of them chose the puppy together, and Aaron was thrilled, she said. In Miami, 13-year-old Zipporah Currie said her new dog, Dolly, smelled like cookies. The second adoption at the Ladew sanctuary in Oyster Bay was another kitten, Chase. Sarah Freeman and Matthew Boyle wanted a second cat to keep their 5-year-old adoptee Boo company. “He’s wonderful,” Freeman said of Boo, who was also from the Ladew sanctuary. “He likes to watch the birdies out the window and he likes to hang out with us." At the Humane Society of Broward County in Fort Lauderdale, Florida, Minty went home with a new family after two years in a shelter. She had been brought to Florida three days ago from out of state. By the end of the day, at least 20 shelters across the country reported they had been cleared of adoptable animals. About 7.6 million animals enter shelters across the country each year, 3.9 million dogs and 3.4 million cats, according to the American Society for the Prevention of Cruelty to Animals. Each year an equal number are adopted or euthanized, about 2.7 million in each case. About 649,000 strays are returned to their owners, the majority of them dogs. Clear the Shelters began in North Texas as a partnership among NBC 5 Dallas-Fort Worth/KXAS, Telemundo 39 Dallas-Fort Worth/KXTX and dozens of North Texas animal shelters. More than 2,200 homeless animals were adopted in 2014, the most in a single day in North Texas. Staab hopes that the adoption drive will become an annual event. A recurring drive can help make people aware of how important it is to spay and neuter their pets, she said. And the advance notice will give shelters time to raise money to offset that cost of spaying and neutering and vaccinations, she said.